It's time for another baby quiz! Answer the following questions either on your own or in our comments section. We'll post the answers next week. 1. 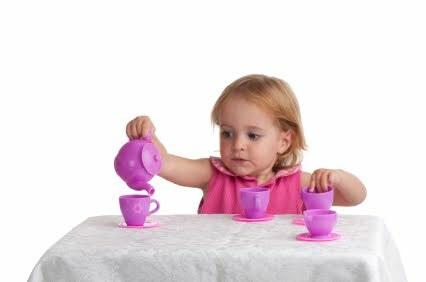 At what age do babies usually begin pretend/imaginary play? 2. 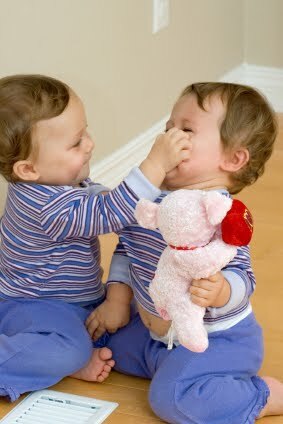 True or False: Recent research shows that babies and young children can not differentiate between reality and fantasy? 3. True or False: Outgoing children are more likely to have imaginary friends than children who are shy? 4. How should babies be put down to sleep? In our last post, we talked about the phenomenon of late afternoon and early evening crying. Now we would like to share a few tips to help you make it through those challenging few hours. Of course, if you have any concern that your baby might be ill, contact your baby’s doctor. If not, try a few of these ideas out and your baby’s “fussy time” may become just a little more peaceful. Remember, this increase in crying is temporary. The peak of infant crying is 6-weeks of age, and crying should get much better by 12-16 weeks. Tip #1: Look for disengagement cues early! I know this time of the day is probably your busiest time, but remember, your baby has had a long day full of learning and growing. If your baby is usually fussy starting around 4pm, start keeping an eye out for your babies 1st disengagement cues around 3 or 3:30pm (these cues will occur before he starts fussing or crying). What to look for? Grimacing, frowning, turning away from stimulation, back arching and squirming. By noticing these early signs of distress you can change your baby’s environment before he starts to escalate his cues and cry. For more about disengagement cues, read one of our original posts, Baby Behavior Basics: Part 3. If you are noticing “I need a break” cues you may need to change your baby’s environment (or diaper!) or stop interactions and let your baby have a break. Infants may be tired from a long day and react to overstimulation with irritability. Sensitive babies exposed to late afternoon or evening changes in light, noise, movement, smells, and activity may become overwhelmed. You don’t have to stop everything, just try a few changes to your routine, like turning the TV off or asking older siblings to play in another room. Does your baby have a meltdown when you go to the grocery store or run errands during the late afternoon or early evening? Try to take care of these trips before your baby’s fussy time. You both will feel much less stressed! After you have checked your baby’s environment for things that may need changed, use repetitive low-key stimulation to calm him like speaking softly over and over, holding, rocking, or stroking the baby over and over. Remember, babies will take longer to calm down if they are very young or very upset. Be calm and patient! This will work! A past post of ours highlighted a recent study that showed carrying your baby for an additional 3 hours per day reduced daily duration of crying by 43%! Often close contact will help soothe your baby, and you will be able to notice early signs of distress. Ask your spouse, partner or another loved one to take over for a while. Take advantage of baby-sitting offers from trusted friends or neighbors. Even an hour on your own can help renew your coping strength. Recognize your limits. If you feel like you are losing control, put the baby in a safe place — such as a crib — and go to another room to calm yourself. Have a friend or family member come over to watch your baby for awhile while you take a break. If necessary, contact your doctor, a local crisis intervention service or a mental health help line for additional support. We hope we have shared some useful tips to support you with caring for your baby during this difficult time. We too have paced the halls with baby in arms for hours on end, and actually, I have some fond memories of nice LONG walks in the early evening the summer after my daughter was born. The combination of fresh air and the soothing movement of the stroller seemed to calm her (and me). We became very friendly with the neighbors on our street that summer, and some of those encounters that started with conversations about our very loud (but beautiful) crying baby have evolved into great friendships and offers of support! Barr R, James-Roberts I, Keefe M. New Evidence on Unexplained Early Infant Crying: Its Origins, Nature and Management. Pediatric roundtable sponsored by Johnson & Johnson Pediatric Institute, L.L.C. 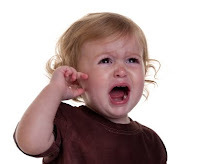 http://www.baby.com/jjpi/for-professionals/New-Evidence-on-Unexplained-Early-Infant-Crying-Its-Origins-Nature-and-Management.pdf. Accessed July 20, 2010. St James-Roberts I, Halil T. Infant Crying Patterns in the First Year: Normal Community and Clinical Findings. J. Child Psychol. Psychiat. 1991;32:951-968. Picture this: it was 6pm; I hadn’t eaten since lunch time (not necessarily healthy, I know) and my 4-month-old was strapped to my hip in a sling while I tried to prepare something that would pass for dinner. The doorbell rang which made the dog bark. As I tried to reach the sugar that was up in the cupboard the phone started ringing. Startled, I dropped the sugar all over the kitchen floor. Does this juggling act sound familiar? With all the commotion, it’s not surprising that, without fail, my daughter would start fussing and crying around this same time of the day, every day, and it would last for about an hour, sometimes longer. I used to call this “Happy Hour” (sarcastically, of course). Many parents report that babies seem to have a fussy time between about 4 and 6 pm when other family members are coming home, dinner is being prepared, and the TV or radio is turned on. Again, it’s not surprising that many babies sometimes reach stimulation overload from the myriad of sights and sounds that occur at the end of the day. If the above story rings true to your experience, you are not alone. For many babies, crying does indeed cluster during the late afternoon and early evening. Studies show that during the peak of infant crying, 6-weeks of age, the largest cluster is in the late afternoon and early evening. 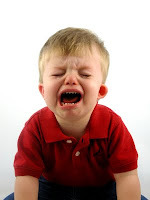 It seems that this phenomenon is more biologically driven than temperament driven because research shows that crying patterns in the first 3 months of life are similar in all babies, whether they are labeled as generally “content” or “fussy.” About half of babies will have an evening crying peak, while 21% of babies will have an afternoon crying peak. Why the late afternoon/early evening? Dealing with crying during the busier times of the day is a big challenge. At the end of a long day, many parents also feel fussy and irritable! My story was so similar to many moms. My daughter and I were alone together for most of the day and we drifted happily through our daytime routines. At dinner time, I turned on the news, the phone would ring, the dog would bark at the front door as a visitor pulled up in the driveway, my husband came home, the lights came on, and I was preoccupied with trying to make dinner or do other household chores. Many times, I missed some of my daughter’s early disengagement cues. You and your baby may have the same experience. Remember, your baby is working very hard to learn and take in the new world around him. When a tired sensitive baby has a flood of stimulation at the end of the day, guess what happens? The baby’s behavior (crying or fussing) intensifies until he is given a break, and since caregivers are so busy this time of the day, it can seem nearly impossible to take a break with the baby. Now that we understand how common it is for crying to cluster in the late afternoon/early evening, we can take a look at how to manage this time of the day and share tips to keep your baby (and you) more comfortable. Next time: Tips to help you manage late afternoon/early evening crying and ways to keep your baby comfortable so that you can both have a more peaceful afternoon or evening. Toddlers have tantrums in response to day-to-day frustrations and conflicts. For example, toddlers may spin out of control when they can’t put their socks on or get you to buy them candy. Tantrums are unpleasant for everyone, especially if they happen in public places. For many parents, giving in to the child’s demands may seem like the only way to deal with the screaming and flailing; other parents see swift punishment as the only answer. Neither of these extremes is likely to help the child or the parent. Fortunately, babies and toddlers are predictable and easily distracted. They also are smaller and easier to contain than older children. Responding early and quickly to your toddler’s signals can go a long way in keeping things under control. While traveling, I’ve been able to watch a lot of infants and toddlers in airports. I’ve seen some very wise and experienced parents deal with meltdowns. Just the other day, I watched a 2-year-old girl start to fuss about taking off her shoes in the security line. As her mother tried to take them off, the toddler plopped down on the floor, pulled her feet away, buried her head in her hands, and started to cry. This very experienced mom realized right away that this was going to be a manageable tantrum. She got down close to her daughter and encouraged her to use words instead of tears. Then, with a childlike lilt in her voice, she told her daughter that when they got on the other side of security, they would see big airplanes. After a moments’ hesitation, the toddler hopped up into her mom’s arms asking where the airplanes were. Later the same day, I watched a furious mom pulling her screaming toddler by the arms yelling that she had better walk “or else.” The screaming kept going even after they were out of sight. By the time your child is between 12 and 24 months old, you’ve had a lot of time to get to know each other. You’ve learned what makes your child angry, frightened, sad, or frustrated. In the past, you soothed away these emotions or provided some effective distraction. As your child gets older, the triggers for these emotions remain essentially the same, but the response is likely to be louder and longer. For example, if your child is frightened by loud sounds, taking your toddler to see a fireworks display is not likely to be fun. When you have a choice, plan your family activities with your child’s needs in mind, at least until your child gets a little older. When you don’t have a choice about your activities, watch for all the disengagement cues that you already know. Watch for signs of fatigue, fear, or discomfort and intervene before your baby loses control. 1. When a meltdown starts, parents have only a few moments to intervene effectively. Distraction is your biggest weapon against tantrums. Use it! When a conflict starts to escalate, be prepared with an attractive option. If your child can’t wear the red shoes, how about the magic green socks; or the special “going to the park” shoes? If possible, include a bonus trip to the park! 2. Help your baby use other parts of his brain. You’ve heard so many moms say “use your words” when talking to crying children. There is a great reason for this. When children are able to verbalize their emotions, they are better able to control the rising emotions. Of course, 2-year-olds are just building their verbal abilities. Help your child learn how to describe his feelings. Praise your child every time that the early signals do not end up in a tantrum. 3. Recognize the signs for a “big one.” Shorter, less intense tantrums will start with tears and just one other behavior (stamping feet or lying down). These tantrums will likely pass quickly if ignored or stopped with a few confident parental instructions. If, however, your child starts a tantrum with several behaviors, especially aggressive behaviors (like those in our picture above), your child is likely to need a lot of help from you. You’ll need to stay calm, remove your child, stop him from lashing out, keep him safe, and recognize that your child cannot control himself. Don't give in or try to distract your child. You'll just have to wait it out. Your child will escalate the tantrum and become increasingly angry for a few minutes. As he realizes that you are not giving in, his anger will turn to sadness and grief. This phase of the tantrum will last much longer than the anger. Don’t give in. Eventually, he’ll turn to you for comfort. He will have learned that 1) you won’t give in and 2) that you are there for him. Don’t worry what others might think or say around you. You can survive this tough time. Toddlers get more control over their emotions and actions as they get older and their ability to communicate improves. You can help them work on self control but don’t expect that discipline will stop toddler tantrums. As children get closer to 3 or 4 years old, they'll have a lot more control over their bodies and feelings. Next time: We’ll share some more information on crying! The toddler brain does not work like the adult brain. When you suddenly hear a barking dog behind a fence, you might be frightened for a moment, but another part of your brain will assure you that you don’t have to be frightened. When you don’t get something you want, you feel frustrated and disappointed, but you recognize and accept that you can't always get what you want (okay, that part might take awhile). If you get into an argument with someone you love, you get angry, but you realize you need to calm down so that you can work things out. A toddler’s experience of these every day occurrences is quite different. Once a toddler is frightened, disappointed, or angry, he may become overwhelmed with emotion and unable to control his actions. As we continue this series on tantrums, we’ll share common triggers for tantrums in children less than 2 years old. Most children have tantrums because they are experiencing one or both of two powerful emotions – anger and distress. For most children, their anger flares for only the first few minutes of a tantrum. When they realize that they will not get what they want, the anger is replaced by distress and sadness. They may cry hysterically for some time until they get tired and seek comfort. When toddlers start tantrums with lots of different behaviors, particularly aggressive behaviors like kicking or hitting, these tantrums are more likely to last longer than those that start with just one or two behaviors liking stamping and crying. An almost 2-year-old is old enough to want to do many things on her own but she is limited in her ability to carry out her plans. She’ll watch what others do (especially her older brothers or sisters) and assume that she can do the same things. Since few toddlers have the coordination and strength of older children and adults, frustration takes hold. At the same time that older infants and toddlers want to do more things for themselves (like dressing themselves), they also become determined not to do certain things (like leaving the park). Because infants and toddlers are not able to control their rising emotions, even little disagreements over activities can boil over into angry confrontations. During infancy, children learn how to give cues to their caregivers to ensure that their needs are met. When they use hunger cues, they are fed. When they show discomfort, they are burped, diapered, or rocked. Sadly (for the toddlers), there comes a time when they find that their parents will no longer give them everything they want. As you might imagine, this takes some adjustment. We all tend to be cranky when we have a headache, stomach ache, or a stuffy nose. When we’re hungry or tired, we’re more easily upset by little frustrations. For toddlers, discomfort can amplify their emotions and reactions, so that little worries can lead to meltdowns. By understanding more about why tantrums happen, parents can take steps (like making sure kids are rested, fed, and prepared before outings) to prevent some tantrums. Unfortunately, there really isn’t anything that parents can do to stop all tantrums. There are just too many factors outside of parents' control. Next time we’ll talk more about interventions parents might try to prevent or shorten their children's tantrums. Osterman K, Björkqvist K. A cross-sectional study of onset, cessation, frequency, and duration of children's temper tantrums in a nonclinical sample. Psychol Rep. 2010; 106:448-54. Potegal M, Kosorok MR, Davidson RJ. Temper Tantrums in Young Children 2: Tantrum Duration and Temporal Organization. Dev Behav Pediatr 2003; 24: 148-154. Potegal M, Davidson RJ. Temper Tantrums in Young Children 1: Behavioral Composition. Dev Behav Pediatr 2003; 24: 140-147. If you haven’t yet had the unforgettable experience of having your own child throw a tantrum in a public place, you’ve probably seen your share of tantrums in stores, restaurants, or at the movies. Nearly 90% of both boys and girls between 18 and 36 months of age have tantrums. Even though it seems like they last forever, most tantrums last between 5 and 10 minutes (75% of tantrums last 5 minutes or less). Children may develop their own tantrum “style” but tantrums typically include one more of the following behaviors: screaming, crying, stamping, throwing, running, pushing, or flailing arms and legs. Sometimes children having tantrums will bang their heads, punch, or kick anyone within reach. While we realize there is plenty of advice for parents to help them understand and deal with their children’s tantrums, we’ll offer our own take on this common experience. Why does a sweet happy singing child suddenly melt down into fits of rage? Why do anger, frustration, sadness, and fear become so out of control in older infants? In the past, parents believed that older infants and toddlers chose to kick and scream to get their way. Babies certainly learn quickly that specific cues or behaviors are likely to get desired responses but these discoveries come out of babies’ experimentation to find “cause and effect,” not out of attempts at manipulation. Older babies’ brains are ready to experience feelings such as anger, disappointment, and frustration but they aren’t able to control those emotions. Think of it like leaving a pot of water on a hot stove and finding that you can’t turn off the burner or move the pot once the water has started bubbling. The water continues to boil, becoming more and more intense until the water evaporates away. Compare this image with that of the toddler shouting with frustration at his mother in a store, getting louder and louder until he bursts into tears and falls exhausted into his mother’s arms. Jen B got first hand experience with a tantrum just a few days ago returning home with her family from a trip to Grandma’s house. Her daughter, Olivia, happy to take trips throughout the weekend, suddenly became aware that they were headed home. “Where’s the beach?” She asked a little distressed, and then asked if they were going back to Grandma’s house. Of course, she was reassured that they would see her grandparents soon but Olivia was already angry and losing control. The screaming and crying began and lasted all the way home. We know that tantrums can be exhausting and embarrassing for parents and children. In part 2 of this series, we’ll share some tips to help you cope with tantrums. Cough and Cold Medicines and Antihistamines: Infant "sleep aides"? All of us (at the UC Davis Human Lactation Center) have been traveling quite a bit. Jane was in Chicago a couple of weeks ago and heard a young father carrying a young baby tell an other airline passenger, “She was so good; it must have been the Benedryl.” She’s also heard health professionals and WIC staff talk about parents using cough and cold medicines to get their babies to sleep. Warnings against “off label” use to sedate babies have started to appear on labels of some pediatric over-the-counter medications. The Centers for Disease Control and Prevention (CDC) has linked cough and cold medicines (including antihistamines) to >1500 emergency department visits and 3 deaths in 2004–2005 among children under 2 years of age. In 2004, the US Food and Drug Administration (FDA) added a warning to the label of promethazine, an antihistamine similar to Benadryl, which contraindicated their use in children under 2 years of age. 4 The warnings were based on “continued reports of serious adverse events, such as respiratory depression and central nervous system reactions, including seizures.” The FDA recently enforced measures against unapproved marketing of the antihistamine carbinoxamine to young children because of reports of 21 deaths that were associated with use of this drug in children who were younger than 2 years. Many antihistamines cross the blood-brain barrier, affecting the central nervous system (CNS) and potentially causing sedation. In some infants and children, antihistamines can have the opposite effect of sedation by stimulating the CNS resulting in irritability, nervousness or insomnia. Another negative “side effect” of antihistamine or CCM use in children is that parents may delay seeking medical care because the medication masks the symptoms of an underlying illness. They aren’t safe, but are they effective? What if children need these medications? 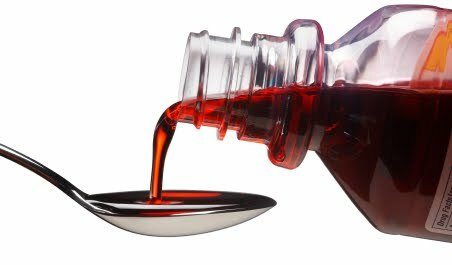 When children are ill or have severe allergies, pediatric formulations of cough and cold medications may be very useful. These medications were intended for intermittent use in children who are under a doctor’s care. But parents need to be told that these medications are not supposed to be used daily by anyone and they might be particularly dangerous to infants. Parents should talk to their pediatricians before using any medications with their babies. Please don’t think we don’t understand how exhausting and challenging it is to have an older infant or toddler that is not “sleeping through the night.” We ALL have been in that sleep deprived haziness at one time or another. We've shared our experience along with a few tips for sleepy parents in our previous posts “Thoughts from a Sleep Deprived Mom” and Tips from the Trenches: Surviving Sleep Deprivation. Thanks to all of you for passing these words along and please continue to send us your feedback! 1. Allotey, P., Reidpath, D.D., & Elisha, D. "Social Medication" and the Control of Children: A Qualitative Study of Over-the-Counter Medication Among Australian Children. (2004). Pediatrics. 114, e378-383. 2. Vernacchio, L., et al. Cough and cold medication use by US children, 1999-2006: results from the slone survey. (2008). Pediatrics, 122, e323-329. 3. Merenstein, D., et al. The Trial of Infant Response to Diphenhydramine The TIRED Study—A Randomized, Controlled, Patient-Oriented Trial. (2006). Arch Pediatr Adolesc Med. 160, 707-712. 4. Simons, F.E.R. Diphenhydramine in Infants. (2007). Arch Pediatr Adolesc Med. 161, 105.